Tools that are taken care of last longer and perform better. Most of us are pretty good about cleaning and maintaining the tools we use in our trades or implements used for enjoyable hobbies. However, far fewer of us clean our cleaning implements or maintain our yard maintenance tools. While our art studios are stocked with clean paint brushes and our woodworking tools are perfectly sharpened and organized, our brooms rarely get a good cleaning and most shovels have probably never been sharpened or oiled. If you immediately started wondering why you would ever want to sharpen or oil something as mundane and utilitarian as a shovel, then this post is for you! 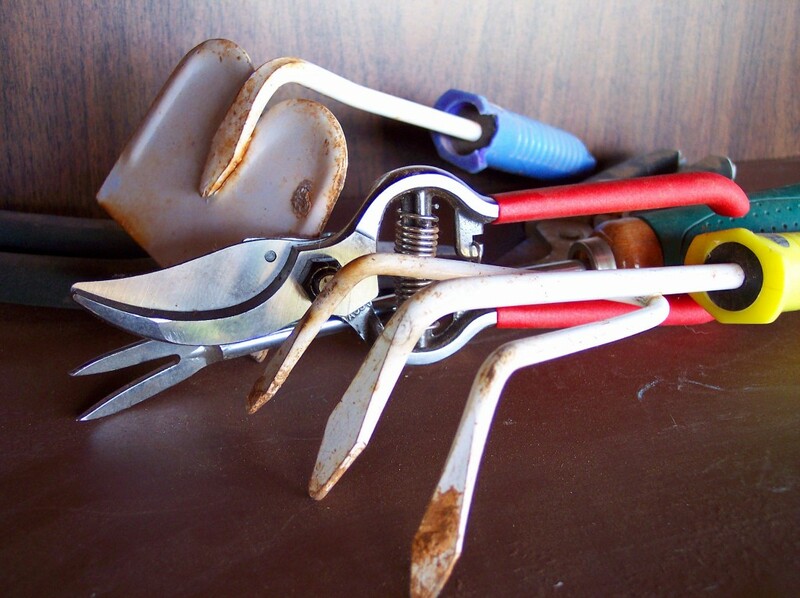 Why Maintain Your Gardening Tools? Even if you have a gardener who does most of your yard work, you probably have at least a few yard tools lying around for use in between their visits or to spruce up your property before a party. There are two primary reasons to clean and maintain the tools you use for yard maintenance. The first reason is make them last longer. Good tools are not cheap, so keeping them in good repair will help you keep your landscaping budget in check and get the biggest bang for your buck. The second reason you should clean and maintain your yard tools is to keep them performing optimally. Dull blades and weathered handles make your job more difficult and increase the possibility of injury. Sharp blades cut through grass, dirt, weeds and branches faster and safer. This means less time and less physical exertion will be required to complete yard maintenance tasks. Chances are you keep your tools out of sight in a garage or shed, but if you do leave them out where guests can see them, you will also want to make sure they are clean and in good repair to avoid further taking away from the visual appeal of your yard. Keeping your tools in a shed or garage is actually a great start towards keeping them clean and in working order. Weather can age your tools prematurely, so if you are keeping your tools protected in a shed, you already have a good start towards making them last longer and keeping them functioning properly. You will notice that I said brooms, not broom. That is because you really should have at least three brooms in your cleaning arsenal. You should have one regular broom for use inside your home, one regular broom for your garage and patios, and a push broom for larger areas. Some folks use push brooms for their garages and patios as well, but a regular broom is much better for getting into corners and cracks. 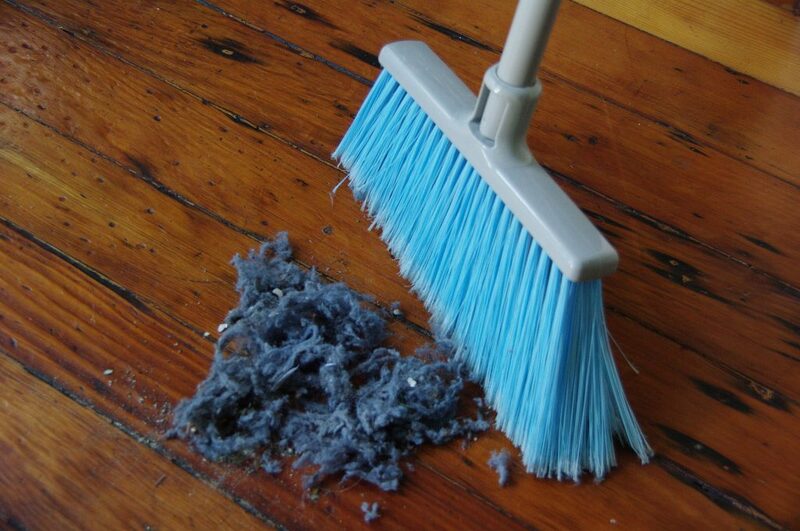 Any broom that you use regularly should have its bristles cleaned about once per week. You can accomplish this by removing debris with your vacuum or by beating the broom against a fence or tree. Brooms that are used often should get a more thorough cleaning about once per month. Fill a bucket with warm water and add a little dish soap – or a little bleach for vinyl bristles – and soak your brooms for an hour or two. A few times a year, rub down wood handles with a rag with a little linseed oil on it to keep the wood in good shape longer. When not in use, brooms should be stored with the bristles off of the floor. A simple hook will work for most inside brooms, but you may want to invest in a wall-mounted yard tool holder to hold larger push brooms and other tools in your garage or shed. Most people do not consider a mop a landscaping tool, but if you have a tile patio, you may want to mop it every once in a while to keep it looking its best or to shine it up before a party. Some people also use mops to clean wood decks. If your mop has a wooden handle, rub it down with a rag with linseed oil on it a few times each year. As for the mop head, it is best to purchase mops with removable heads that can be simply tossed in the washing machine between uses. If your mop head is permanently attached, clean it every couple of weeks by soaking it in a bucket with equal parts water and vinegar or in a bucket with hot water and a little bleach. Keep in mind that this is for outside mops; mops used indoors in bathrooms or kitchens should be cleaned more often. Make sure your mop is hung with the mop head off of the floor so that it can dry completely between uses. If you use sponges to clean your outdoor kitchen, patio furniture, outdoor dining room table or toys that are kept outside, you will want to regularly clean your sponges as well. The easiest way to clean sponges is to sanitize them in the dishwasher, but you may not want to put particularly dirty outdoor sponges in the dishwasher with your dishes. You can kill germs and clean your sponges by soaking them in distilled white vinegar, and then placing them in the microwave for about two minutes. This will help extend their life a bit, but you should still replace cleaning sponges about once per month. Plastic leaf rakes can usually be cleaned with a simple wipe down or by removing debris by spraying it down with your hose. A bit more care should be taken with metal rakes, which can rust. Wipe the rake head down with a little vegetable oil every few months, or stick it in a bucket or storage bin filled with sand mixed with oil. This is actually something you can use with lots of metal gardening tools, so it is worth taking a minute to more fully explain this. Metal yard maintenance tools can benefit from having a little oil rubbed on them now and then to help avoid rust and increase their longevity. You can spray them with oil marketed specifically for this purpose or rub them down with a little vegetable oil, which is the more economical option. Alternatively, you can fill a bucket or plastic storage bin with sand and mix in vegetable oil until the sand is thoroughly moistened. It saves you some time doing it this way, since you can simply stick the metal part of your tool in the sand between uses, rather than taking the time to rub them down every once in a while. You can store your tools like this regularly, store gardening implements like this when your vegetable garden is dormant, or just stick your tools in there after every few uses to oil the metal and avoid rust. When you remove your tools from the sand-oil mixture, you can just tap them on the ground to remove any sand sticking to them, or you can polish them with a rag. Wood handles also benefit from an occasional oiling, so rub down wooden handles with linseed oil at least a few times each year to protect the wood and extend your tool’s longevity. Shovels should be cared for in much the same manner as rakes with one exception: They should also be sharpened. Sharpening your shovels can help you avoid dings in the edge that could hinder function and increase the chance of injury. It also will make your shovels cut through dirt or other items more effectively, making your yard maintenance tasks easier. How often you should sharpen gardening tools like shovels depends on how much you use them, but most folks will only need to do this a few times each year. Sharpening larger yard maintenance tools – like shovels and hoes – requires a mill file, which you can purchase at any home improvement store. Garden hoes essentially require the same care as a shovel. Storing them in a sand-oil mixture every once in a while will help you avoid rust, and wood handles should be rubbed down with linseed oil a few times a year. Hoes should also be sharpened with a mill file to keep them functionally optimally, but they will likely need to be sharpened more often than your shovels. This is particularly true if you have rocky soil or use your hoe often for weed removal. As is true with all of your gardening implements, it is best to hang your hoe for storage to avoid the head sitting on the ground. Soaker hoses can be cleaned by placing them in a bucket of warm water with a bit of dish detergent. Leave it soaking for a few hours to loosen dirt and debris, then remove from the bucket, attach to the faucet and allow water to run through it to push out the loose debris. Hoses that seem to have a buildup on the exterior of the hose may have mold. 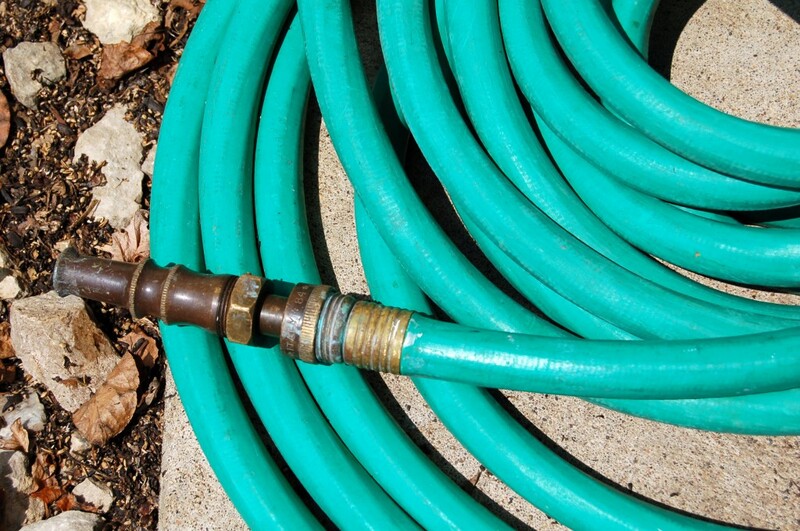 To remove mold from a hose, soak the hose in a bucket or plastic storage bin filled with water and bleach. Remove your hose from the water-bleach solution and spray it off with water. Hose nozzles can also get a bit gunky over time. You can easily clean nozzles by soaking them in a bucket of warm water and dish soap. This will loosen dirt and debris. You can then use a small, wire brush, a small scrub brush or a stiff toothbrush to scrub it clean. Rinse it off, and you should have a clean nozzle that will function better. If your trowel, gardening fork or other small gardening tools have wood handles, rubbing them down with linseed oil a few times a year will increase the longevity of the handles. Plastic tools can usually just be wiped down or sprayed with water to remove debris. Metal tools should be stored in your sand-oil mix at least occasionally to avoid rust. You can also just rub them down with a coat of oil every month or so, if you prefer. Since these tools are much smaller, you can use a planter or flowerpot for your sand-oil mixture and just keep it on a shelf for whenever you want to stick them in there to clean them up. Some smaller tools, such as pruning shears, will also need to be regularly sharpened. Because the edge of pruning tools and shears need to be particularly sharp, you may want to have them professionally sharpened. If you prefer to do it yourself, you will need to invest in a hand-held sharpener and be very careful when sharpening the edges. Reel mowers can become quite dirty, but they are easy to clean. Most of the debris will be grass clippings and dirt, which can be easily sprayed off after each use. If you allow this debris to dry on the mower, it will be more difficult to remove. Leaving wet grass on the blades can also promote rust. Like other metal yard tools, the blades on your push mower can benefit from being rubbed down with a little vegetable oil about once per month. You will also need to sharpen the blades to keep it functioning properly. Reel mower blade sharpening kits are available at most home improvement and hardware stores and are relatively easy to use. If you are concerned about the potential for injury when working with these sharp blades, you can also have them professionally sharpened. 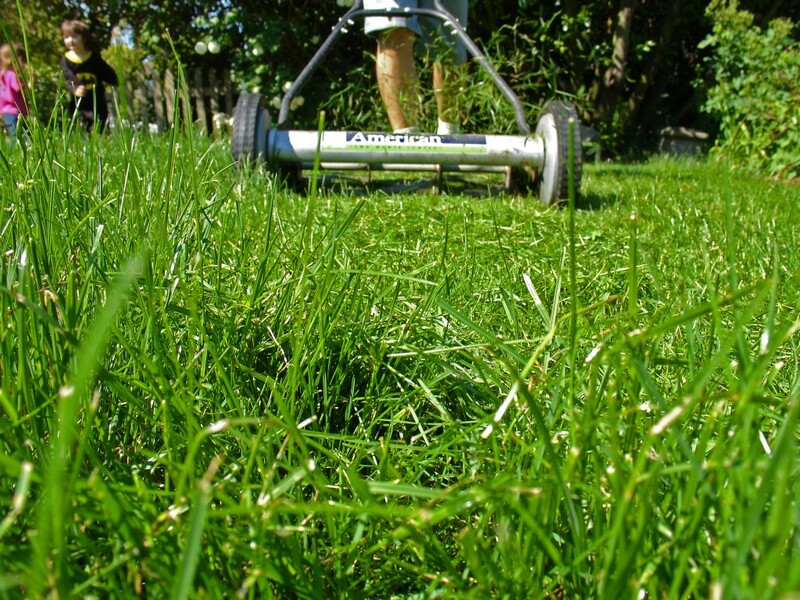 Make sure to store your manual mower in a shed or garage to lengthen its life and avoid rust. Keep in mind that you can avoid cleaning and caring for any type of mower if you replace your natural grass lawn with a low-water, low-maintenance artificial grass lawn.